A new radio program has gone on the air in the Catskills, and is available worldwide. WORK SHIFT provides commentary on jobs and careers, especially as affected by current events. It made its debut May 29, 2013, and is broadcast on WJFF 90.5 FM, a PBS affiliate in Jeffersonville, New York. The program airs from 10:00 to 10:05 on Wednesday mornings, and streams online at the same time at http://www.wjffradio.org/ . The host is James B. Huntington, author, most recently, of Choosing a Lasting Career: The Job-by-Job Outlook for Work's New Age. 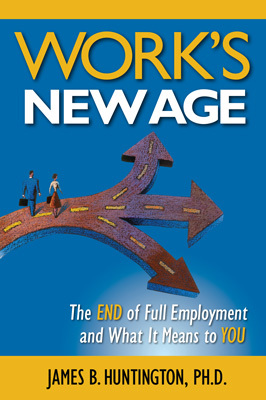 He also wrote the 2012 IPPY Award-winning Work’s New Age: The End of Full Employment and What It Means to You. Choosing a Lasting Career: The Job-by-Job Outlook for Work’s New Age reveals the jobs and careers most worthwhile for the next 20 years. It provides a detailed, multiple-perspective look, naming the prospects, advantages, and disadvantages of 506 jobs and 25 entire careers. It assesses our national work situation, and shows what it means for career choices. The book also addresses self-employment as it really is, and alerts us to related, stunning events probable in the decades to come. It is comprehensive, broad-based, and well-grounded not only in the past and present, but especially, and uniquely, in the future. It fills what had previously been a gap between personality career assessment and the tactics of job-seeking. Work’s New Age is the 2012 IPPY Award-winning book showing what is happening with American jobs. It describes the true nature of the jobs crisis and why it will not end. The book shares how the work situation has affected and will affect national social patterns, and assesses a wide range of possible solutions. It concludes by naming what Americans must to do to shift successfully to the new jobs reality. Among other newspaper and magazine appearances, the Work’s New Age thesis was chosen for the New York Times Sunday Dialogue, May 19, 2013. It has also been the subject of interviews on over 130 radio stations nationwide. James B. Huntington is additionally the creator and keeper of the AJSN (American Job Shortage Number). The AJSN is the key economic indicator showing latent demand for jobs in the United States. He also writes the Work’s New Age blog at http://worksnewage.blogspot.com/ . He has a B.A. in sociology from the University of Wisconsin-Milwaukee, an M.B.A. from the University of Phoenix, and a Ph.D. in Applied Management and Decision Sciences from Walden University. He has also been a business professor, teacher, scholarly writer, and professional speaker. He is married and lives in Eldred, New York. Work’s New Age and Choosing a Lasting Career are available at www.amazon.com, www.barnesandnoble.com, at bookstores (on the shelves or special-ordered), and from the publisher at www.royalflushpress.com or 845-456-0115. Kindle and Nook electronic versions are also on the market.